Emma Gonzalez and other Marjory Stoneman Douglas students returned to the school Sunday for orientation as part of a phased reopening. The school officially reopens today. Image by Joe Raedle/Getty Images, found on New York Times. In the two weeks since the Parkland massacre, we’ve seen the worst and the best of our fellow humans. But what has impressed me most is the determination shown by the survivors. It’s not just their poise in the face of the sorrow they feel over having lost so many friends, but their tenacity and willingness to fight back against lies and conspiracy theories spread about them on social media, and to do it with sly humor. If I didn’t know better, I’d swear these kids were long-lost relatives. But they don’t know any better, silly people that they are. By the way, dude, excellent Princess Bride reference! 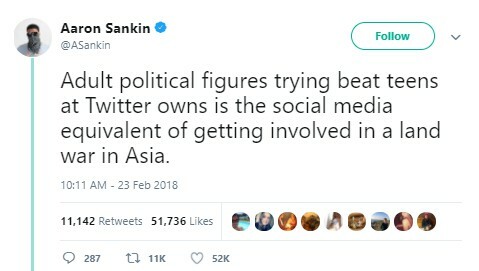 Screenshot from Aaron Sankin’s Twitter page. I said last week that the Parkland students are part of a media-savvy generation, one that’s grown up totally in a post-Columbine world, and social-media platforms like Facebook and Twitter have been around for the bulk of their young lives. Their command of social media is just one reason their movement became so big so quickly. 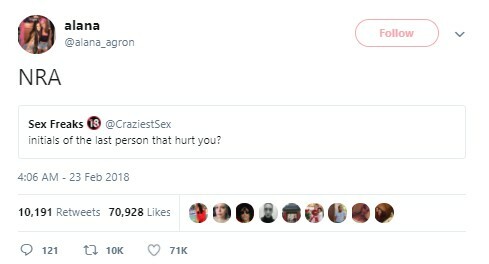 Screenshot from Alana Agron’s Twitter page. No, there’s no indication that George Soros, the eternal boogeyman of the far right, is pulling the strings, but people like George and Amal Clooney (Amal is a human rights lawyer, ya know) and Oprah Winfrey have donated big sums to the cause, and ordinary citizens have donated smaller sums as well. If you want to make some contribution to the movement or to help the victims and their families, NBC gathered some links to various verified funds, which you can find here. 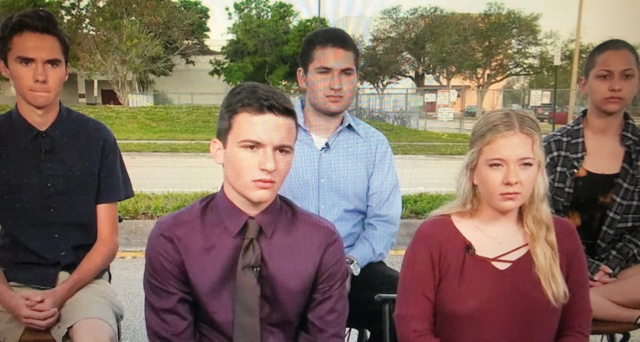 (From left) David Hogg, Cameron Kasky, Alex Wind, Jacqueline Coren and Emma Gonzalez speak to Face the Nation. Image found on Sara D. Roosevelt Park Coalition. 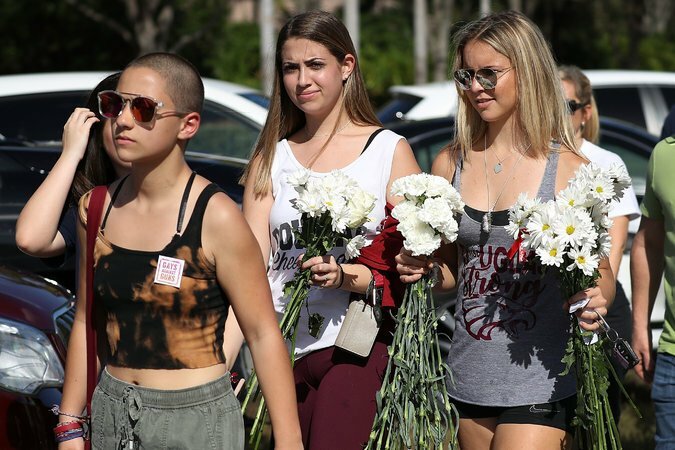 Since the day of the shooting, conspiracy theories have abounded (partly thanks to Russian trolls, according to PolitiFact), one of the insidious of which is that the most outspoken of the students—among them David Hogg, Emma Gonzalez and Cameron Kasky—are “crisis actors” and that the shooting was set up by the CIA, FBI or any number of other “evil” entities. Oh, Cameron, I love that you went for Cruella! 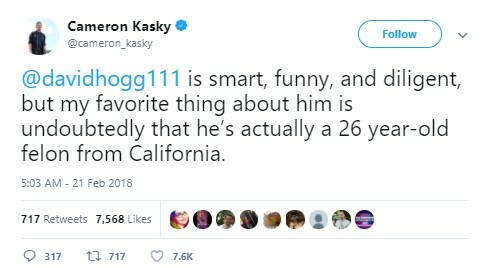 Screenshot from Cameron Kasky’s Twitter page. 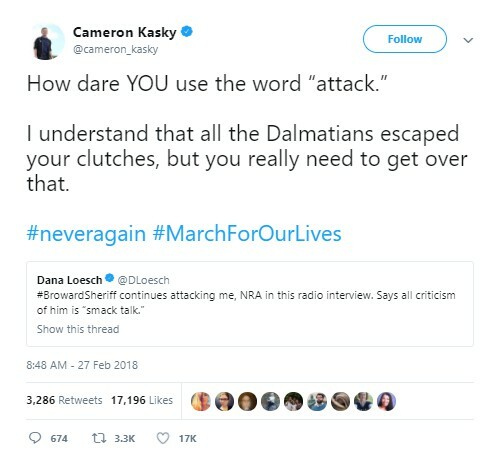 This is the same sort of thing that was pulled after the Sandy Hook shooting (with one survivor supposedly being in Parkland, Boston and Sandy Hook), but this time, the targets are fighting back ferociously … and trolling the trolls. I knew there was a reason I liked them. 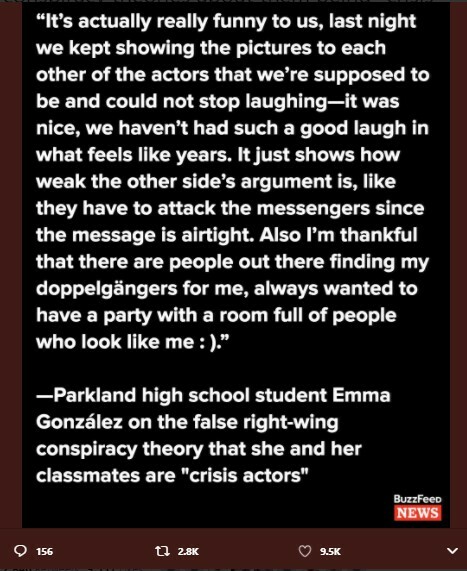 To be clear, there is such a thing as a “crisis actor,” and it refers to people who participate as victims in drills to help train police and other agencies on how to deal with disasters like chemical leaks, earthquakes, shootings, and the like. 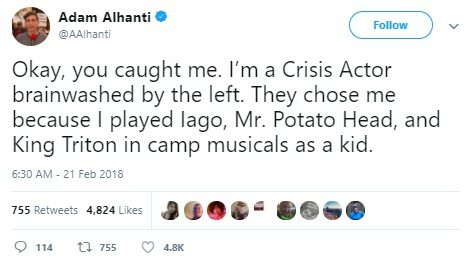 In this case, though, the survivors are not actors. I heard he killed as Mr. Potato Head. Screenshot from Adam Alhanti’s Twitter page. And you just know there are people out there who believe both of those tweets. Gonzalez (whose shaved head, by the way, isn’t so much a political statement, she says, as it is more a statement on how hot Florida can get, especially if you have long hair) told BuzzFeed of the “crisis actor” rumors: “I’m thankful that there are people out there finding my doppelgangers for me; always wanted to have a party with a room full of people who look like me.” Gonzalez, who started her @Emma4Change Twitter account a couple of days after the shooting, now has more followers than the NRA. I have no idea how many of those followers might also be doppelgangers, but they seem to appreciate her activism and sense of humor. Partying with a doppelganger can be fun! Screenshot from Remy Smidt’s Twitter page. By responding the way the students have, they’ve taken away the power of the trolls simply by showing that those “people” aren’t to be taken seriously. So far it seems to be a more effective strategy than simply debunking them, and it’s provided more than a few giggles, humor being a great coping mechanism. It hasn’t all been laughs for the kids, though their ability to maintain a sense of humor after so much vitriol has been aimed at them speaks well for their collective mental strength. Between mourning lost classmates and teachers, and fighting for their newfound cause, some have faced threats. Apparently the people attacking them don’t understand anything about trauma. Or they just don’t care because it didn’t happen to them. 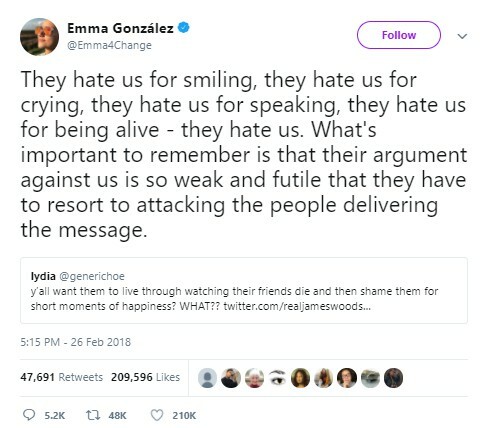 Screenshot from Emma Gonzalez’s Twitter page. 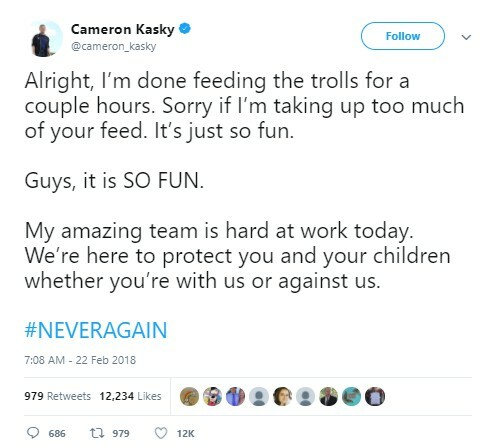 Kasky is taking a break from Facebook because of the death threats he’s been receiving. Hogg’s younger sister, Lauren, a shooting survivor who lost four friends, called out Melania Trump for her stepson’s having “put a target” on her back thanks to Donald Jr. liking a false conspiracy tweet. She and other members of her family have also received death threats, as have other survivors. And still they persevere, answering false charges and nasty attacks with facts, grace and humor. I wanna be them when I grow up. I swear I will at some point. Sometimes you have to take your laughs where you can get them. 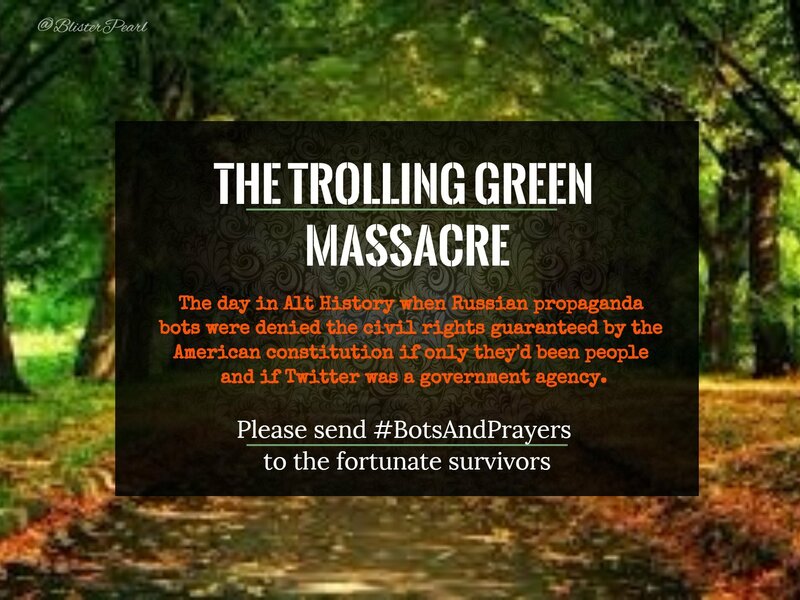 Meanwhile, let’s bow our heads in remembrance of those trolls/bots that lost their Twitter accounts (though some no long enough) in the recent Twitter lockout, now known by some as the Trolling Green Massacre. My heart bleeds for them … oh, no, wait, that’s my ice cream melting. It’s just so sad … that it took so long. Thursday will mark the third anniversary of my embolic stroke in 2015. For those who’ve asked, I’m mostly fine, though do continue to have occasional problems with my short-term memory. I did deal this past year with an ulcer and most recently a respiratory infection, but my health is, overall, OK. Thank you so much to those who have expressed concern and support for me over the past few years. It has meant more to me than you could ever know. With any luck, I’ll be here for a good long time, cracking wise, being nerdy with words, and generally annoying those who think hyperpartisanship is the way to get things done (well, if the things getting done are spreading unfounded rumors and debunked tales, then maybe). My mama expects no less.